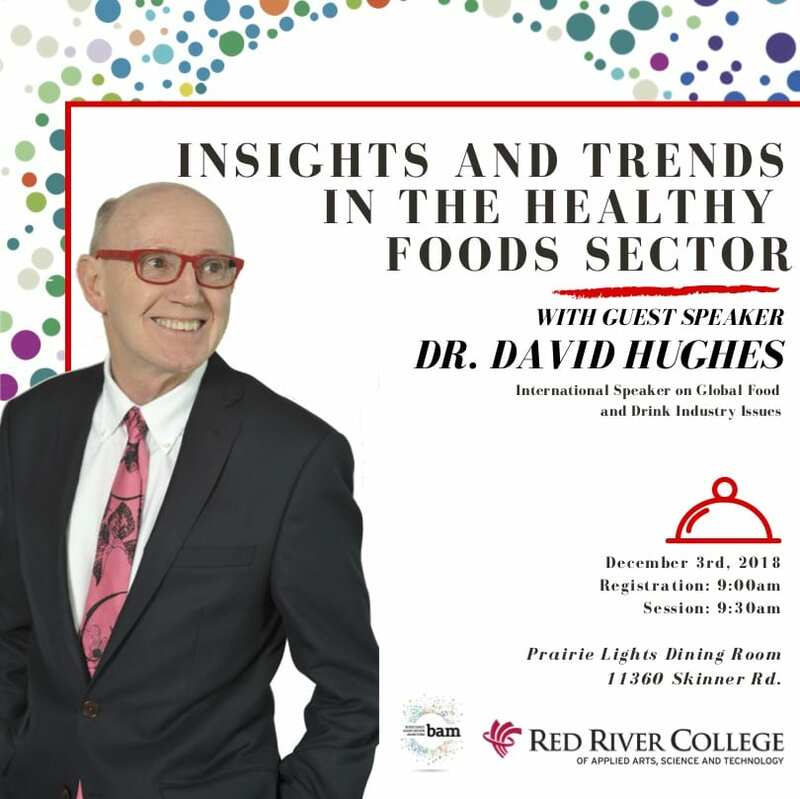 Red River College, in partnership with Bioscience Association Manitoba, is pleased to welcome Dr. David Hughes, international speaker on global food and drink industry issues, to the Prairie Lights Dining Room on Monday, Dec. 3rd for a talk on “Insights and Trends in the Healthy Food Sector.” The event is free and all are welcome. Please register in advance at: biomb.ca. Professor David Hughes is an Emeritus Professor of Food Marketing at Imperial College London, and a Visiting Professor at the Royal Agricultural University, U.K. He is a much sought-after speaker at international conferences and seminars on global food industry issues, particularly consumer and retail trends. David has lived and worked in Europe, North America, the Caribbean, Africa and South East Asia and has extensive experience as an international advisory board member with food companies and financial service organizations on three continents. For 20 years, he was a Non-Executive Director of Berry Gardens Ltd – a U.K. farmer-owned berry fruit business (£230 million turnover in 2015). With his American business partner, David established, grew and sold a branded fresh produce business which served supermarkets in the USA. Around the globe, he works with food and beverage supply chain companies – including farm input, growers, manufacturers and ingredient companies, retailers and food service firms – to assist them in management training, strategy and Board level decision-making. David’s views are frequently sought by TV, radio and the printed press. Prairie Lights Restaurant is located on your right, next to Tim Horton’s in the Mall Level.